Adiponitrile (ADN) is a key precursor to hexamethylenediamine (HMDA) production. About 90% of HMDA is consumed in the nylon 66 chain, with nonnylon use mostly in hexamethylene diisocyanate for high-performance polyurethane paints, coatings, and epoxy curing agents. There has been strong growth in the latter in the past five years. HMDA demand has slowly recovered from the 2008 downturn, and is expected to reach a level 11% higher than that seen in 2007. Adiponitrile is produced in the United States, Western Europe, and Japan. The United States continues to be the main exporter of ADN. Gradual capacity increases by Ascend and INVISTA in the United States have led to increased production. Butachimie in France is the only producer in Western Europe, and will continue to remain so during the forecast years. Asahi Kasei has a unit in Nobeoka. Capacity changes in the adiponitrile market are forecast to be minimal in the coming years. The mature nylon fibers market has the largest influence on world HMDA demand. This correlation, however, plays a less dominant role in Japan and a decreasing role in the United States and Western Europe, as nylon resin begins to account for a larger share of the HMDA market. Demand for fiber continues to be lackluster, especially in the United States and Western Europe, with overall demand growing at a rate less than that of GDP. Most HMDA demand growth in North America and Europe will result from increased demand in the nylon 66 resin industry, primarily in automotive applications such as exterior automotive body components, under-the-hood components, and some mechanical components. Consumption of nylon 66 resins in the automotive industry is expected to grow at or faster than GDP rates with the auto industry’s continued acceptance of nylon over metal for a variety of automotive components. Other growing nylon 66 resin applications include electronic applications, film, and extrusion coatings. Demand in Northeast Asia will continue to be the driving factor. China continues to forge ahead with strong, robust growth in nylon 66 applications, with strong growth expected for HMDA and adiponitrile over the next five years. Asia will remain heavily dependent on exports from other regions despite the start-up of INVISTA’s new HMDA plant in Shanghai, as this new capacity is meant to meet China’s increased demand following nylon 66 and HDI capacity expansions. 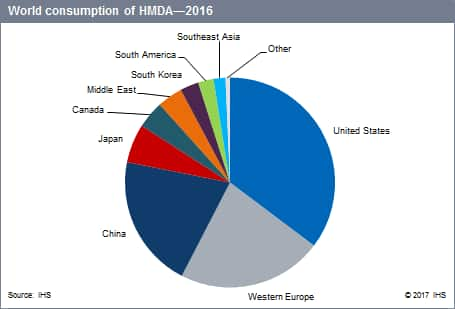 Global consumption of HMDA is forecast to grow at an average annual rate of about 2%, with the rate of growth declining somewhat in the United States and Canada, and growth rates of 10–13% in China and Taiwan.